In researching recipes for barbecued brisket, we found that cooks could agree on one thing: slow-cooking (for up to 12 hours) to tenderize the meat. We wanted to figure out a way to make cooking this cut of meat less daunting and less time-consuming, and we wanted to trade in a professional smoker for a backyard grill. We brined the brisket to season it throughout and to make sure the meat remained juicy even after hours on the grill. In our tests, we had trouble figuring out how to maintain a low temperature in the grill without frequently refueling. But then we realized that fire can burn down as well as up. We layered unlit briquettes on the bottom of our grill and added hot coals on top for a fire that burned consistently in the optimal 300 F range for about 3 hours. We then transferred the brisket to the oven to finish cooking. If your brisket is smaller than 5 pounds or the fat cap has been removed, or if you are using a small charcoal grill, it may be necessary to build an aluminum foil shield in order to keep the brisket from becoming too dark. To do this, make two 1/2-inch folds on the long side of an 18-by-20-inch piece of heavy-duty aluminum foil to form a reinforced edge. Place the foil on the center of the cooking grate, with the reinforced edge over the hotter side of the grill. Position the brisket fat side down over the cooler side of the grill so that it covers about half of the foil. Pull the foil over the brisket to loosely tent it. Some of the traditional accompaniments to barbecued brisket include barbecue sauce, sliced white bread or saltines, pickle chips, and thinly sliced onion. Lightly score brisket fat cap in 1-inch crosshatch pattern, being careful not to cut into meat. Dissolve salt and 1/2 cup sugar in 4 quarts cold water in large container. Submerge brisket in brine, cover, and refrigerate for 2 hours. While brisket brines, soak wood chunks in water for at least 1 hour; drain. If using gas, soak wood chips in water for 15 minutes, then drain. Using large piece of heavy-duty aluminum foil, wrap chips in 8 by 4 1/2-inch foil packet. (Make sure chips do not poke holes in sides or bottom of packet.) Cut 2 evenly spaced 2-inch slits in top of packet. Combine remaining 2 tablespoons sugar, kosher salt, and pepper in bowl. 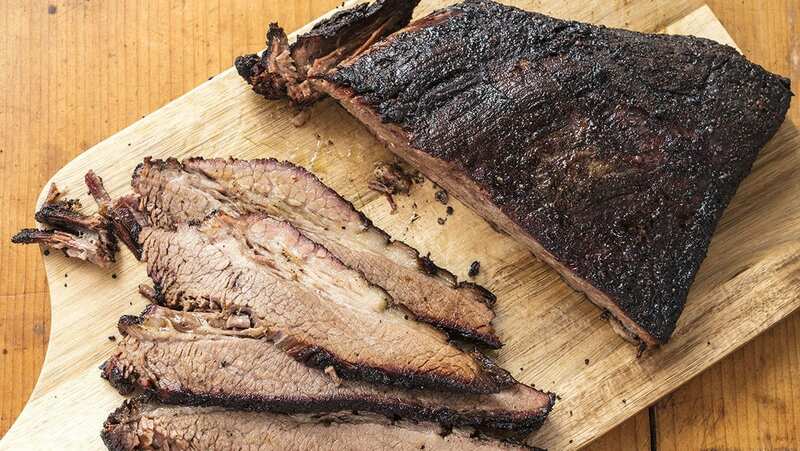 Remove brisket from brine and pat dry with paper towels. Transfer to rimmed baking sheet and rub salt mixture over entire brisket and into slits. For a charcoal grill: Open bottom vent halfway and place disposable roasting pan on 1 side of grill. Add 2 cups water to pan. Arrange 3 quarts unlit charcoal briquettes banked against other side of grill. Light large chimney starter two-thirds filled with charcoal (4 quarts). When top coals are partially covered with ash, pour on top of unlit charcoal to cover one-third of grill with coals steeply banked against side of grill. Place soaked wood chunks on top of coals. Set cooking grate in place, cover, and open lid vent halfway. Heat grill until hot, about 5 minutes. Clean and oil cooking grate. Place brisket on cooler side of grill, fat side down, as far away from coals and flames as possible with thickest side facing coals and flames. Cover (position lid vent over meat if using charcoal) and cook for 3 hours. During final 20 minutes of grilling, adjust oven rack to middle position and heat oven to 325 F.
Set wire rack in rimmed baking sheet lined with foil and transfer brisket to rack. Roast in oven until tender and meat registers 195 F, about 2 hours. Transfer brisket to carving board, tent with foil, and let rest for 30 minutes. Slice brisket against grain into long, thin slices and serve. Nutrition information per serving: 451 calories; 260 calories from fat; 29 g fat (10 g saturated; 1 g trans fats); 120 mg cholesterol; 1833 mg sodium; 3 g carbohydrate; 0 g fiber; 3 g sugar; 45 g protein.